The benefits of exercise extend beyond burning calories. Exercise also boosts your mood, reduced your risk of health conditions, such as type-2 diabetes and heart disease, and strengthens your bones and muscles, according to the Centers of Disease Control and Prevention. Losing weight through exercise allows you to continue to eat the foods that you enjoy, which makes sticking to your weight loss program easier. However, weight loss through exercise alone may not be as quick as weight loss through a combination of diet and exercise. 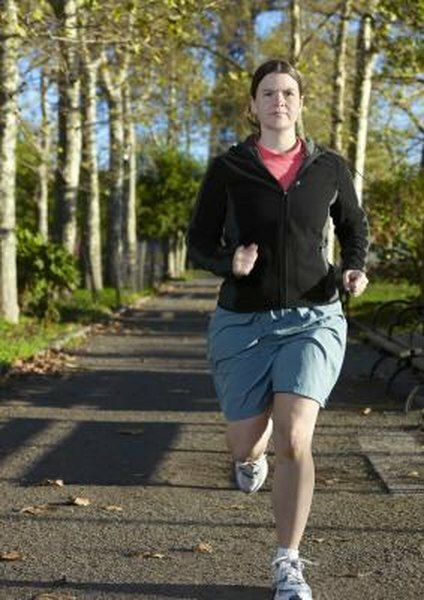 Make cardiovascular exercise the base of your weight-loss program. Exercise about one hour on most days of the week. According to the National Weight Control Registry, this is likely to result in lasting weight loss. Choose activities that you enjoy and include a variety of exercises, such as jogging, cycling and exercise DVDs so that you don't get bored. Include strength training in your weight-loss routine. Muscle cells require three times more calories to maintain than fat cells, according to Fitness Magazine, so building muscles not only creates a firmer appearance, but also boosts your metabolism. Change your workout frequently. Boredom makes it difficult to stick to any routine, and exercise is no different. Mix up your workout with old and new activities. Stick with activities you love, but don't be afraid to drop activities you don't care for. Challenge yourself with skill-based exercise, such as racquetball and kayaking. You may find a new favorite hobby. Increase your overall activity level. Rather than sitting on the couch and watching television after dinner, take a walk around the neighborhood. Volunteer to coach your child's soccer team. Today's lifestyles are typically sedentary. While intentional exercise, through aerobic and strength training, is important, so is boosting your general activity level. Weigh yourself regularly. When you use a weight-loss program that doesn't focus on diet, it is important to gauge your progress on a regular basis. Without a strict calorie count, it is easy to let activities such as parties or visits to restaurants boost your calorie consumption. Knowing that you are working out more than usual makes it easy to think that you can afford additional treats. These treats can add up quickly and put a stop to your weight loss. Watch your diet. While it is possible to lose weight through exercise alone, don't inadvertently eat more in response to the increased activity. If you don't see results on the scale after adding exercise to your schedule, keep a food diary to track the number of calories you consume each day. Consult a doctor before starting a new exercise routine, particularly if you've been inactive or are dealing with a medical condition or injury.